NOTICE!!!!!!!!!!!!!! The pitch of the propeller is extremely important! Ordering the wrong propeller pitch will result in poor performance. All propeller returns are subject to a 15% restocking fee with no refund on shipping charges. 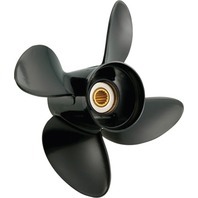 This new propeller can only be returned within 14 days of receiving and only if the propeller is not used. If you are not confident in your decision Email or call us we are happy to guide you. Why Buy a Solas Aluminum Prop? 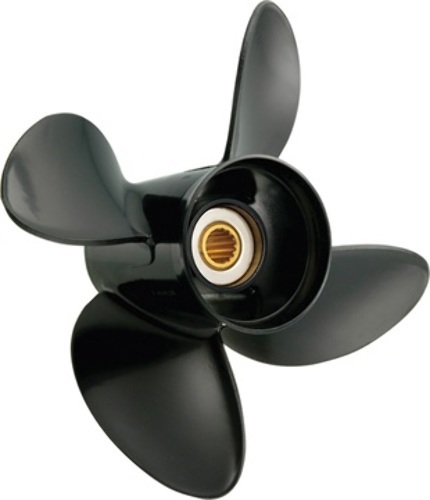 Solas aluminum propellers surpasses regular stainless steel propellers in terms of thinness, corrosion resistance, and quality. Every Solas aluminum prop is squeeze-cast to remove tiny air bubbles that can form in the casting process for increased density and toughness over a traditional die cast aluminum prop. As shown to the right with 400x magnification of a propeller blade root cross-section the squeeze cast aluminum propeller is almost non-porous, with finer grain size than the die cast aluminum prop. Each Solas aluminum prop is then finished with 4 layers of paint to ensure superior anti-corrosion properties and to keep your Solas Propeller looking good year after year. Numerous tests conducted by major media authorities have proven that Solas Propellers stand up to collisions better than the competitors', and long-term durability studies have shown that Solas Propellers' resistance against rust and corrosion outperforms all the others in their class.